Information about the National Pollutant Discharge Elimination System Manual. 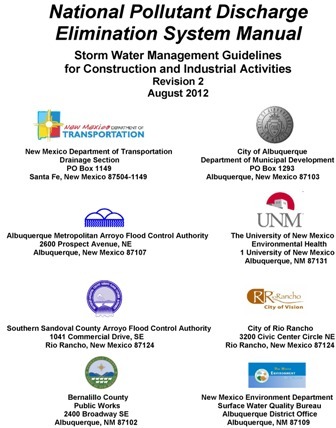 To report waste and toxic dumping, call the Storm Water Hotline at (505) 768-3003. The new 2012 Construction General Permit has been completed by the U.S. Environmental Protection Agency (EPA). According to the New Mexico Environment Department (NMED) Surface Water Quality Bureau this can be a section in the Storm Water Pollution Prevention Plan, and has to be certified by a New Mexico Professional Engineer. Currently the City of Albuquerque is using the RUSLE program to determine potential sediment transport before, during, and after construction activities. This program was developed by the United States Department of Agriculture (USDA) Natural Resources Conservation Service (NRCS). The New Mexico NRCS web site has the soil physical properties for Bernallillo County. For a simpler approach to the RUSLE Model go the NM NRCS Agronomy Technical Note. NOI forms now have a seven-day waiting period to allow the U.S. Fish and Wildlife Service time to review regarding endangered species.